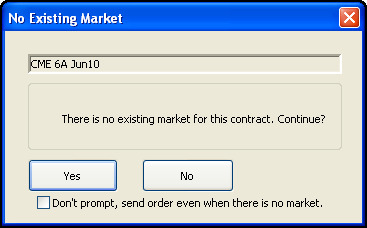 You receive the following dialog box when you attempt to submit orders on a contract without a market. This happens when you are using Direct Order Entry or a Theo (Single or Bid/Ask) as your Profile Base Price. Submit the order anyway. Click Yes. Cancel your order. Click No. If you always want to send orders to the market without receiving a prompt even if a market does not exist, select the Don't prompt box before clicking Yes or No.